ESO Signs Agreement with Breakthrough Initiatives. ESO has signed an agreement with the Breakthrough Initiatives to adapt the Very Large Telescope instrumentation in Chile to conduct a search for planets in the nearby star system Alpha Centauri. Such planets could be the targets for an eventual launch of miniature space probes by the Breakthrough Starshot initiative. ESO, represented by the Director General, Tim de Zeeuw, has signed an agreement with the Breakthrough Initiatives, represented by Pete Worden, Chairman of the Breakthrough Prize Foundation and Executive Director of the Breakthrough Initiatives. 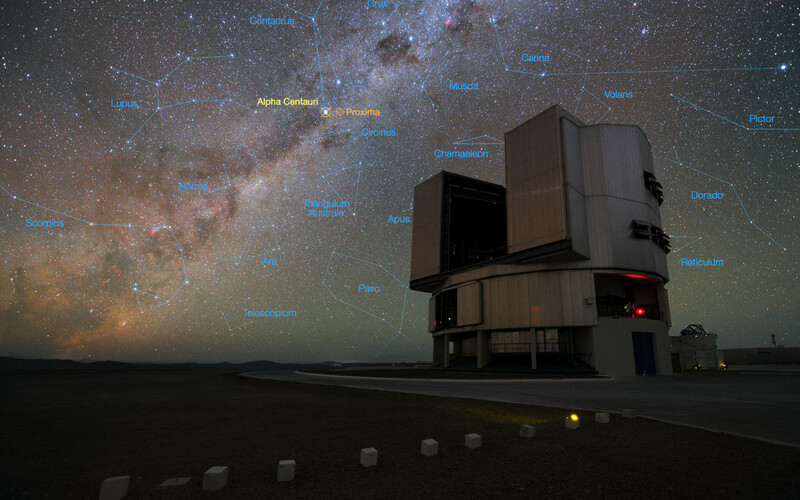 The agreement provides funds for the VISIR (VLT Imager and Spectrometer for mid-Infrared) instrument, mounted at ESO’s Very Large Telescope (VLT) to be modified in order to greatly enhance its ability to search for potentially habitable planets around Alpha Centauri, the closest stellar system to the Earth. The agreement also provides for telescope time to allow a careful search programme to be conducted in 2019. 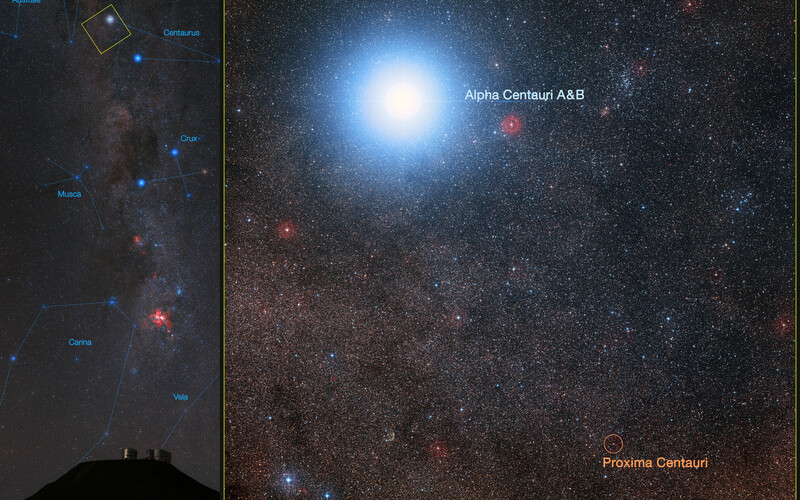 The discovery in 2016 of a planet, Proxima b, around Proxima Centauri, the third and faintest star of the Alpha Centauri system, adds even further impetus to this search. Knowing where the nearest exoplanets are is of paramount interest for Breakthrough Starshot, the research and engineering programme launched in April 2016, which aims to demonstrate proof of concept for ultra-fast light-driven “nanocraft”, laying the foundation for the first launch to Alpha Centauri within a generation. Detecting a habitable planet is an enormous challenge due to the brightness of the planetary system’s host star, which tends to overwhelm the relatively dim planets. One way to make this easier is to observe in the mid-infrared wavelength range, where the thermal glow from an orbiting planet greatly reduces the brightness gap between it and its host star. But even in the mid-infrared, the star remains millions of times brighter than the planets to be detected, which calls for a dedicated technique to reduce the blinding stellar light. The existing mid-infrared instrument VISIR on the VLT will provide such performance if it were enhanced to greatly improve the image quality using adaptive optics, and adapted to employ a technique called coronagraphy to reduce the stellar light and thereby reveal the possible signal of potential terrestrial planets. Breakthrough Initiatives will pay for a large fraction of the necessary technologies and development costs for such an experiment, and ESO will provide the required observing capabilities and time. The new hardware includes an instrument module contracted to Kampf Telescope Optics (KTO), Munich, which will host the wavefront sensor, and a novel detector calibration device. In addition, there are plans for a new coronagraph to be developed jointly by University of Liège (Belgium) and Uppsala University (Sweden). Detecting and studying potentially habitable planets orbiting other stars will be one of the main scientific goals of the upcoming European Extremely Large Telescope (E-ELT). Although the increased size of the E-ELT will be essential to obtaining an image of a planet at larger distances in the Milky Way, the light collecting power of the VLT is just sufficient to image a planet around the nearest star, Alpha Centauri. The developments for VISIR will also be beneficial for the future METIS instrument, to be mounted on the E-ELT, as the knowledge gained and proof of concept will be directly transferable. The huge size of the E-ELT should allow METIS to detect and study exoplanets the size of Mars orbiting Alpha Centauri, if they exist, as well as other potentially habitable planets around other nearby stars.